Have you come to terms with your terms and conditions? 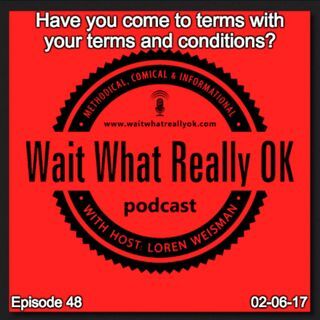 Wait What Really OK Podcast Episode 48 hosted by Brand Precision Marketing Strategist and Counselor, Loren Weisman asks, Have you come to terms with your terms and conditions? Like insurance and other preventative maintenance measures, many only add them or get them after something goes wrong. Still, in a world of ambulance chasing lawyers and people ready to sue at the drop of a hat, it is the best move, the safest move and smartest move to get these pieces together and in place today. Podcast Blog Supplement for Episode 48 of the Wait What Really OK Podcast with Loren Weisman. Podcast Link Supplement for Episode 48 of the Wait What Really OK Podcast with Loren Weisman. Why do you need a statement of work for your clients and customers? Podcast Video Supplement for Episode 48 of the Wait What Really OK Podcast with Loren Weisman. Podcast Photo Supplement for Episode 48 of the Wait What Really OK Podcast with Loren Weisman.